Mario & Luigi: Bowser’s Inside Story (AKA Mario & Luigi RPG 3!!! orマリオ＆ルイージRPG 3!!! Mario ando Ruīji Ārupījī Surī!!! in Japan) is a RPG video game developed by AlphaDream for the NDS (Nintendo DS) console. The game was published by Nintendo in 20019 and is the third installment in the Mario & Luigi series, after Superstar Saga and Partners in Time. 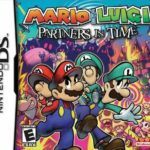 If you are getting bored with the typical Mario & Luigi storyline, then this game has something new to offer. Bowser, the Koopa King who always gets beaten up by the brothers, is now, unintentionally, part of the team. While storyline was never a signature strength for the series—because no one is constantly entertained when a princess always ends up getting kidnapped or lost no matter what—the developers managed to incorporate an interesting storyline this time. Browser inhales the shrunken Mario and Luigi in the beginning of the game so you will technically control Bowser through the brothers who are inside him. Together, you will find your way to get the three Star Cures to stop the disease called “The Blorbs” from spreading and to defeat the mad scientist, Fawful. As you play the game, you will discover more hilarious surprises in the story which will certainly keep you hooked. The characters’ attitude, especially Bowser’s, are accurately highlighted in the story. The transition of the scenes is smooth. Above all, the originality of the story gives the game a fresh look for the series, not to mention the couple of twists added to the turn-based gameplay. On the other hand, the 3D graphics of Mario & Luigi: Bowser’s Inside Story are high-grade. They are some of the best on NDS. The character sprites are impressively animated. Plus, the colorful environments are finely detailed. The music used in the game is as remarkable as what was used in the first game, Superstar Saga. The tunes are exciting and engaging. Furthermore, the sound effects are spot-on and are clearly heard through the console’s speakers. Mario & Luigi: Bowser’s Inside Story for the NDS is indeed a total package! It has decent gameplay, appealing soundtrack, top-notch graphics, and magnificent story. As the best title in the series, this hilarious but epic game is definitely a must-play!